Each week I get the opportunity to meet and interview guilds and other members of this community. It is amazing to see the amount of time, effort and dedication these people put into adding enjoyment to a game. However that is what people are willing to do when they find something they love to do and truly enjoy. This week’s Community Checkpoint puts the spotlight on a guild that demonstrates those attributes. The Thirteenth Legion is also a part of another community, that of the role-playing community. Their RP backstory for their guild, is what first got my attention…it deals with Star Wars and history, what’s not to love. This guild was gracious with their time to entertain my questions and share their enjoyment for this game and RP. How did the guild get its start? 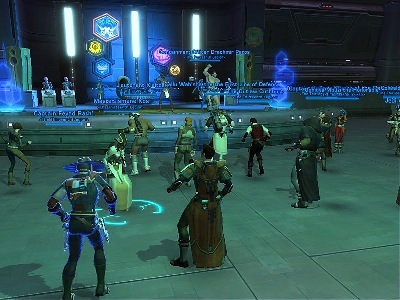 Is SWTOR the first game for this guild? 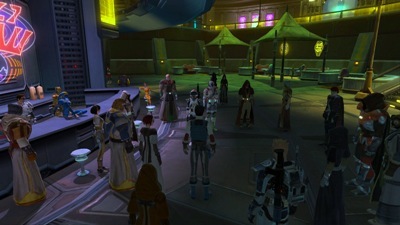 The guild started in April of 2010 in the SWTOR forums with the beginning of Phase 1 prior to the game’s launch. It was formed initially to provide a place for a group of friends in Atlanta who RP together in real life regularly, but quickly expended to include people from all over the world. The XIIIth Legion was built specifically for SWTOR, we don’t have any plans currently to branch out into other games, though many of our members do play together in other games. What type of guild is the Thirteenth Legion? Where can the Thirteenth Legion be found server-wise? 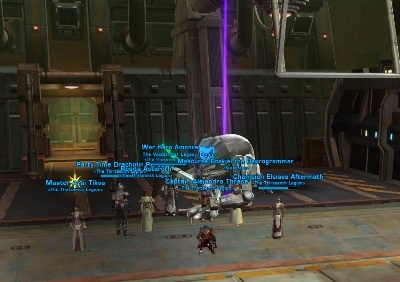 The XIIIth Legion is a casual PVE-RP Republic guild on the Ebon Hawk. We want folks to come and play the game in whatever way they want in an environment that is mature and drama free. We range in age from 16 to over 70 with an average age in the mid-30’s. Most of us are married, have a job, own a home, and have children of our own. Our members include real life couples, parents and their adult children and real life friends as well as many wonderful people from around the world who found us via recruitment posts, or by grouping with our members, in-game. We are all mature enough to know that real life is more important than any game. We are here to have fun together exploring the world of SWTOR. We have people who enjoy every part of the game and we tend to be very social while doing so. We love to conquer content, but most importantly, we love to work together and have fun. Sparkle powder and games of “pass the tank” amongst sages in ops are the norm, as are naked Esseles runs at midnight and dance parties after guild events. Even if we are failing miserably we are having fun and learning to work together better. 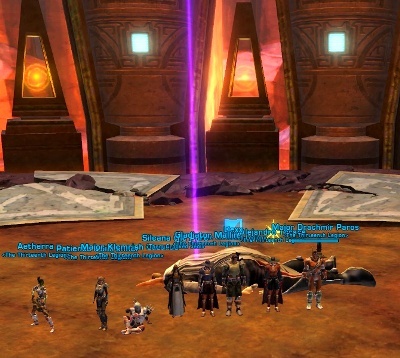 Our primary rule for all members and associates is “be nice”—that means being good citizens of the guild, of the server community and of the SWTOR community as a whole. Most RP guilds have a backstory. Your guild has a very unique one. Who came up with the backstory and how has the guild used it in-game as far as events, questing, etc.? Our original Guild Leader, Scorpienne, came up with our back story. The Real 13th Legion (from Roman Antiquity) was created by Julius Caesar prior to the Gallic War and it took the best soldiers from all the other legions. It stayed with Julius Caesar when he rebelled and set up the Roman Empire. Where ever the 13th Legion went so did the Roman Leadership, they were king makers. We’ve modeled our Legion after this. We were at the Sacking of Coruscant on a suicidal mission to buy the members of the Senate time to escape and took the brunt of the casualties. It was so bad that Republic Leadership thought of dismantling the unit all together, but a call was sent out to the all the other units in the Republic. Some of the best came and we’ve rebuilt the XIIIth Legion. Most of the RP has been focused on how everyone came to join the XIIIth Legion— not everyone has a clean past. It makes for a great group dynamic RP-wise. Many of us are alt-aholics, so we have an imperial guild that houses our Imperial toons. Its purpose is to be a constant thorn in the side of the XIIIth Legion. They kidnap important persons in the guild, former lovers have appeared to torment Jedi with accounts of their children in the Sith Academy, and all sorts of other mischief, has been had. We are always moving forward in the game. We use a lot of the RP to create new storylines for both guilds to interact with each other. We have incorporated the RP to create PvP events between our two halves along with friends in other guilds and provide the reason for FP crawls. For example, in one RP story line our guild leader had been kidnapped and a meeting was called to follow up on leads as to her whereabouts. Groups were sent on level-appropriate heroics and flashpoints that we chose to fit in with the RP to “retrieve” certain items or information. Along the lines of role-play (RP), there are some basic guidelines. What are some basics you could tell people if they wanted to try their hand at RP in SWTOR? Keep it simple. If it’s your first foray into RP, just try creating a back story for your character and try sticking to that character’s motivation when answering questions in conversations. They may not always create the easiest road for your gaming experience, but it will be much more satisfying when you get to the end. You never know when forging new friendships, consequences in story lines, or other “life” events may change your character’s outlook on life. Observe how others RP to get a feel for it. Much of the RP is carried out in /say, so it is easy to sit on fleet or in a cantina to get a feel for the conventions. This guild has a well defined breakdown system for each member’s rank. How does this help the guild? Can you elaborate on the breakdown and each level of ranking in the guild? We keep it simple, a Guild leader > an XO > a group of Officers > and then the membership. A simple command structure lets folks know who to go to with problems. No one really has power in the guild. The Guild Leader and the XO discuss just about everything, then we take it the officers for their opinions and lastly to the membership as a whole. We do have officers who have primary responsibility for certain areas. We have two Master Storytellers who keep track of and help guide the guild-wide RP, Centurions who are our “jack of all trades” go-to people when guild members need help, PvP-Centurions who specialize in helping those new to PvP get comfortable and an officer who is primarily responsible for our Empire-side activities. The titles are more of a way to divide the work load so that things don’t fall through the cracks. In reality, we all do a bit of everything and the vast majority of decisions are made by a consensus of officer opinion or that of the guild as a whole. Most guilds today use some form of voice-chat system to help communication in-game. Does the Thirteenth Legion use voice-chat? If so which system does the guild use? How does RP factor into voice-chat? We have a mumble server that is embedded with our enjin site. We don’t generally RP over voice chat, because we do have men playing female characters and women playing male characters, though some members do have static leveling groups that they RP in voice chat. We do most of our in-game RP in /say or party chat and a significant amount of RP occurs in collaborative fiction and individual fiction on our forums. Is the Thirteenth Legion currently recruiting? Should interested players still submit applications? What type of people does the guild look for in potential new members? We aren’t actively recruiting currently, but we do always take in people that have exceptional applications. We take all kinds of people. We don’t recruit specific classes, but instead we are looking for fun mature people to play with. All of our members can see and comment on applications. We look for complete answers that show the applicant is mature and will get along with us. Applicants who seem like they will “fit” with us are brought on as associates first so that we can all have a chance to get to know them. We also accept applications from those who would just like to join us as associates because they don’t have the time to be a member of a guild or are already members of other guilds and just want to join us on occasion. There has been talk about things members in the RP community want to see in-game. What are some of those things? 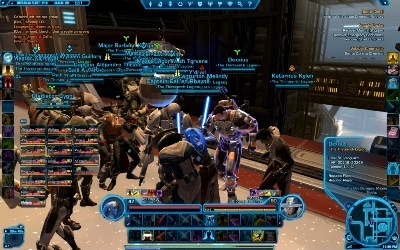 Can you also explain “chat bubbles” and why they are an important item RP players want to see in SWTOR? There are a few things I would love to see in-game. I would love to see: weather, day-night cycles, chat bubbles, working chairs and the ability to create your own series of missions in game. I would love to see weather and day/night cycles for the same reasons, it would add a more immersive feel to the game and give the option of having mobs have special powers when certain conditions are active. Chat bubbles would take say out of the chat window, and give a better visual queue as to when someone is talking. It’s a far more immersive experience, not to mention the fact that it keeps some of the clutter out of the chat window. As for the Create your own series of missions, we run RP events that we go on missions and do certain things that are already in the game. It would be awesome to write a mission synopsis and tell the program what mission needs to be completed next, just like when you are running a specific world’s quest line. This would allow us to create a more smooth operation when we are running RP events, instead of having everything in an excel spreadsheet and giving out orders in chat. Motivation – your a big alien & you just have been defeated. What is your current main character’s class/advance class and level? Do you play alts and do you and the guild play on the opposing faction? Alejandro: My Main is a level 50 Gunslinger named Alêjandro. I have 7 alts that I currently play 3 of which are level 50 as well, and with the 4 extra character slots, I’ll be creating more alts soon! Yes, we have an imperial guild as well. Currently named Unforgiven @ The Ebon Hawk. We are currently in the process of renaming our imperial guild. Sami_jo: My “main” is a level 50 Sage healer named A’zai. I currently have all twelve character slots filled (7 Republic and 5 Imperial), though one is just a name holder for my future Cathar. All are in either our Republic or our Imperial guild. I have limited play time, so while I play all of them regularly, my next highest character is only level 27 (though several are already 400 crafters). Most of my alts are in static leveling groups with various guild members. For players wanting to learn more about the guild, participate in some of your RP events or just meet in-game how is the best way to contact the guild? We would love if folks would come to our website and read up on us. Oh, and if you see one of the XIIIth Legion members, in-game or on the website, just say hi and mention how you heard about us, we’re a friendly bunch! Thanks to all the members from the Thirteenth Legion. It was great to meet and learn about your guild. Huge thanks to their executive officer Sami_jo for helping to coordinate communications for me with the guild. Also thanks to their guild leader Alejandro for taking the time to help answer my questions and send me the images used in the article. 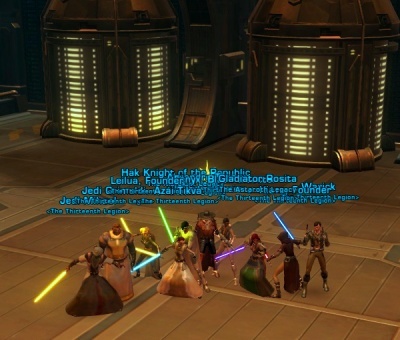 If any of you are on the Ebon Hawk server and want to learn or enjoy RP or just want to hang out with a great bunch of gamers…head on over to their website or look for members of the Thirteenth Legion in-game. Do you or a group/guild that you know of strive to sponsor or support in-game events on your server? If you are an event planner or a leader/member of a guild, why not contact me, so we can share with the community about what you are doing. Just submit your guild/group’s website and some basic information in an email to me at, jason@corellianrun.com. Here at Corellian Run Radio, I am looking forward to highlighting more guilds and the many of you working at planning events, contest, etc. Thanks and see you next week!